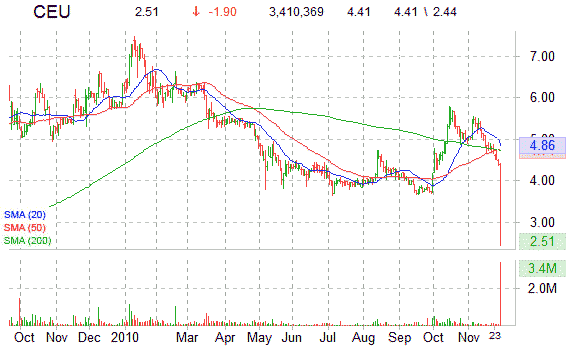 China Education Alliance, Inc. (CEU) is nosediving on heavy volume. More than 3.4 million CEU shares have already traded hands. The stock is currently at lows of the day as it prints the tape at $2.41, a loss of more than 45%, making it the biggest percentage loser on the day. CEU currently trades at a trailing P/E of 4.46, a forward multiple of 3.16 and a PEG of 0.30. Update: ticker halted, news pending.